We survived the Blizzard of '96! 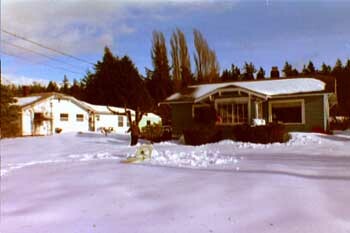 In another shameful example of how Chuck Dingee lied to and misled Kathy Sheehan about the beauty and temperate climate of the Pacific Northwest, three feet of Christmas snow and hail prevented the Bellingham couple from leaving their home for nearly a whole week. "No, I do not want to watch Pee Wee Herman's Christmas special again. Ever," Sheehan cried after a glazed-eye Dingee began rewinding the VCR. "Nor do I want to eat those 2-year-old peas in the freezer, with the leftover chicken" she cried out from the basement where she was searching for her foul weather sailing gear. "You promised I would never have to date again if I married you and that I would never have to put up with snow, sleet or ice! "I'm calling my lawyer! ... Now where the heck are my Goretex pants so I can wade through these chest-high drifts?" Dingée, who continues to claim a healthful, soft mist covers the Pacific Northwest most of the year despite the obvious need for lawn sprinklers in the summer and -- now -- shovels in the winter, smiled in his typical demonic way. "They're in the garage, dear," he said. Both garage doors, of course, were behind four-foot-high snow drifts after a week of snow, snow, snow, sleet, freezing rain, hail, and snow. The couple, who were to celebrate their 134th wedding anniversary Jan. 4, 1997, somehow managed to survive the blizzard with the help of a half dozen videos, a backgammon board, bread maker, a deadline for Sheehan to take the test for her captain's license, and, of course, the Internet.